Nia Coffey fights through defenders. The senior forward’s big game wasn’t enough to lift Northwestern over Penn State on Sunday. Penn State still has Joe McKeown’s number. 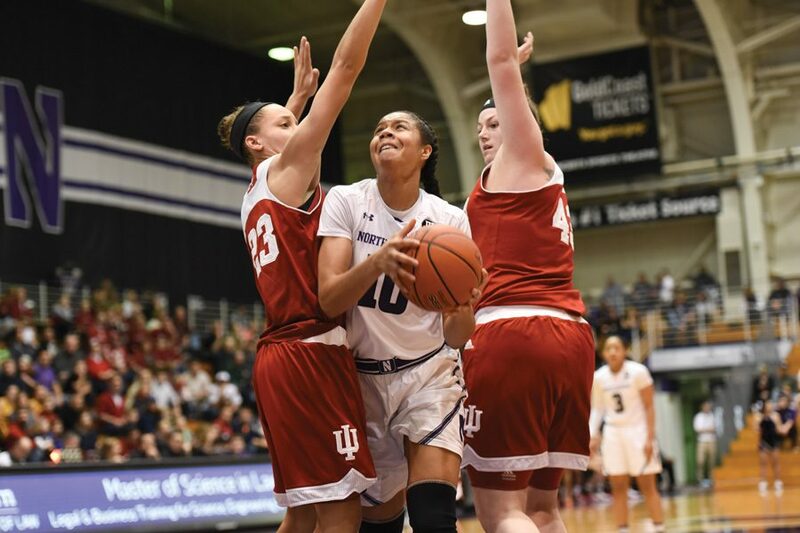 Northwestern (17-6, 6-4 Big Ten) fell to the Nittany Lions (15-8, 5-6) 74-58 at Welsh-Ryan Arena on Sunday, dropping McKeown’s career coaching record to 0-21 against Penn State. Sunday’s defeat marks McKeown’s 12th in eight-plus seasons with the Wildcats in addition to nine losses at George Washington, his prior longtime coaching gig. The loss complicates the Cats’ path to a double-bye in March’s conference tournament. NU now sits in a three-way tie for fourth place in the Big Ten standings with Michigan State and Purdue and just one game ahead of both Indiana and Iowa. Although the Cats currently own head-to-head tiebreakers over each squad except the Hawkeyes, who they play Feb. 16, their margin for error is infinitesimal following the loss. Six games remain on a relatively easy schedule, and NU could conceivably run the table. But Sunday’s loss to a young and inexperienced Penn State team shows the Cats’ vulnerability. The first half was a back-and-forth affair, with neither team going ahead by more than 6. NU appeared to gain the upper hand after a 12-2 run late in the second quarter, but Penn State bounced back to take the lead going into halftime. It was the third quarter that did NU in. While the Nittany Lions didn’t put together a singular, huge run that broke the Cats’ backs during the frame, NU missed 12 shots and was outscored 19-10 in the quarter. Penn State kept the pressure on in the fourth, hitting clutch shots to prevent the Cats from making a comeback. On the day, five Nittany Lions scored at least ten points, compared to two for NU. “We just took some quick shots, which resulted in them doing what they like to do which is transition offense, and that’s kind of where we lost control of the game,” senior guard Ashley Deary said of the second half. Senior forward Nia Coffey did everything she could to prevent her coach from falling to Penn State for the 21st time. Coffey registered a double-double with about six minutes remaining in the second quarter — her 12th double-double in 23 games — and finished with 28 points and 17 rebounds, both of which were game-highs. However, after scoring 10 points in the first quarter, Coffey and the rest of the Cats went cold. NU shot just 33.9 percent from the field Sunday and was just 3-of-12 from three-point range. With their two-game homestand wrapped up, the Cats will head on the road for their next three contests. Because NU’s matchup against Minnesota was postponed earlier this season, it will play all three games in a six-day span.